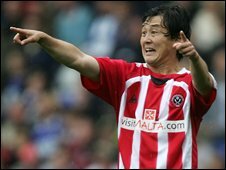 Sheffield United defender Sun Jihai has left the club and returned to China after one season at Bramall Lane. The 31-year-old joined the Blades last summer, but made only 11 league starts over 12 months. Blades manager Kevin Blackwell told BBC Radio Sheffield: "Sun found it difficult to settle here. He was living with his mother and missed his family. "He was a great professional and was a great example to the young players at the club. I wish him all the best."